“Extra! 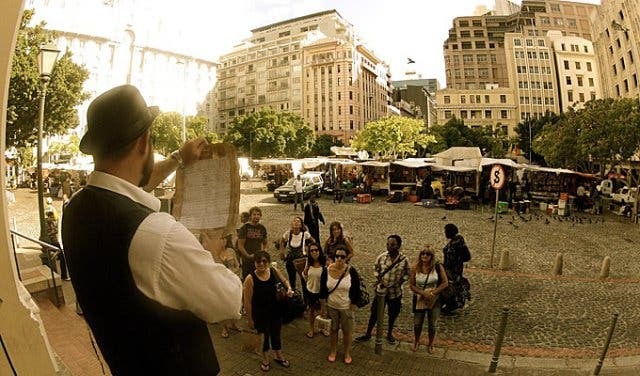 Extra!” A voice boomed over the sound of raindrops drumming on umbrellas in Greenmarket Square as we (me, an American, a couple of Germans and a Western Cape newbie) were led through the wakening Cape Town city centre towards the crier. 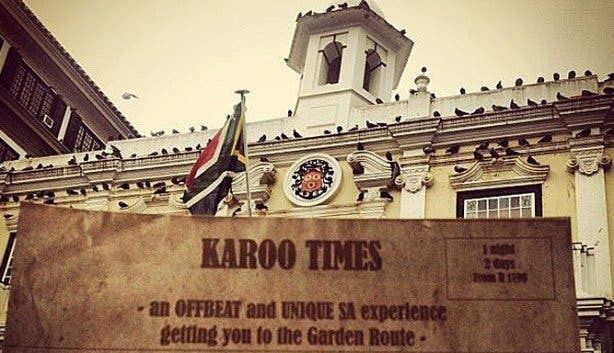 Baron Riaan Renke, dressed in old-timey regalia complete with pocket watch and walking stick, handed us an edition of the Karoo Times, and it dawned on us that our journey had officially begun. 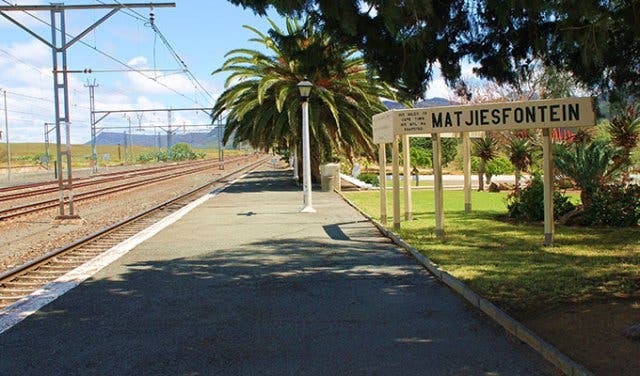 This was the start of the Forgotten Route, a two-day, all-inclusive Karoo adventure from Cape Town to blink-and-you-miss-it Matjiesfontein with tour operators and owners of Wine Flies tours, Riaan and Lord Francois van Binsbergen. The Wild West-ish excursion into South Africa’s often overlooked but no less fascinating and beautiful semi-desert region is equal parts learning and laughter, and it takes wanderers along the same dusty trails traversed by early prospectors during the Kimberly Diamond Rush in the late 1800s, with storytelling to recreate scenes of ox wagons and Victorian living. 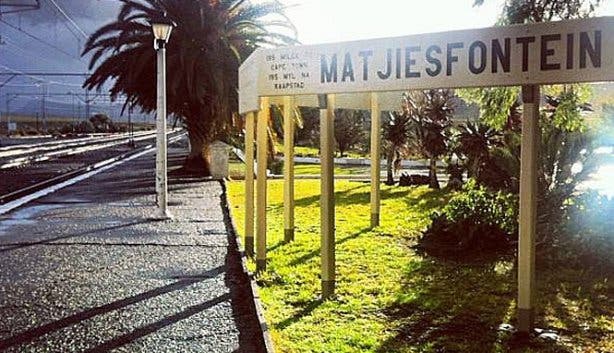 The final destination, Matjiesfontein, remains frozen in this bygone era, a time when the town was the height of fashion and luxury for grand lords and ladies. 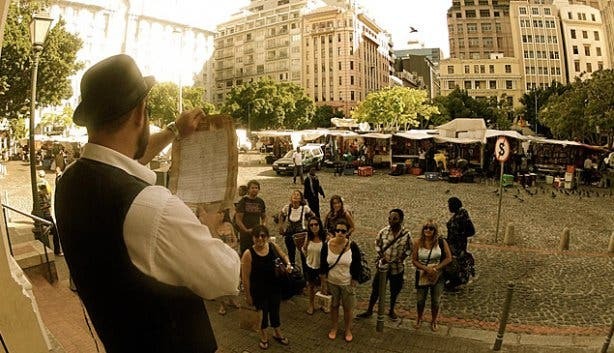 Everyone has done (or at least definitely should do) the Garden Route, and, just like the famed coastal drive, the Forgotten Route is an experience South Africans and international travellers should add to their touring bucket list. 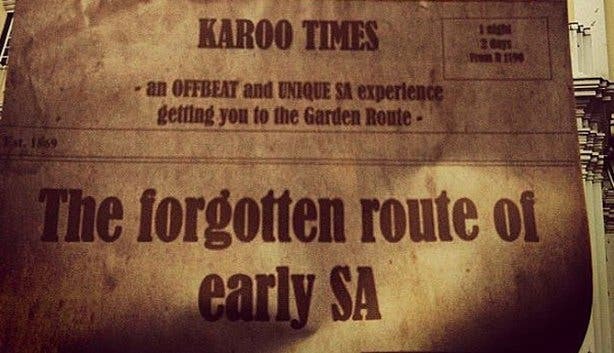 After a half-glance at the prophetic Karoo Times (it gave details of the trip’s itinerary), we took a quick historical walk through the Company’s Garden then drove to the Kimberly Hotel, a landmark bar built in 1895 that was the original starting point for diamond prospectors heading to Kimberly. 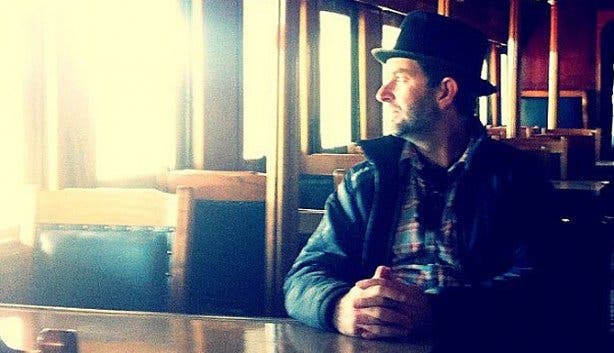 While being warmed by the original 19th century woodwork and cups of coffee, Francois declared that we would need passports, and so, with a brown-cased Polaroid camera, he took each of our photos to stick in passport booklets. Now we were ready. We headed East by bus alongside the fast-flowing Breede River until a perfectly formed rainbow serendipitously arched over our first stop in the Breedekloof Valley: Kirabo Private Cellar. The boutique winery specialises exclusively in reds, and we sampled five of their silky, smooth vintages in the cosy, fire-lit tasting room. 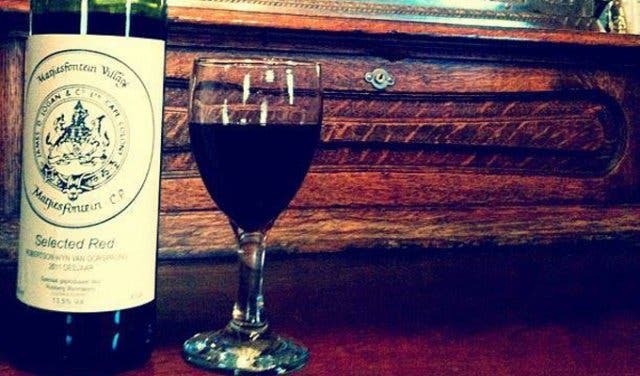 The last one, a Merlot-Shiraz blend called Cupcake, was served with homemade cupcakes made from the wine – together, the combination tastes like fairies dancing on your tongue. After stocking up on a couple of bottles for later and with decidedly higher spirits, we set off to Worcester where we were to board the Shosholoza Meyl for a train ride to the heart of the Karoo. 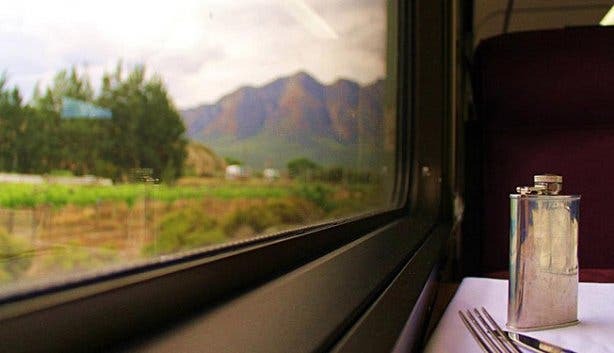 Old music floating from a scratchy record player and little glasses of port welcomed us from the train into Victorian-era South Africa. 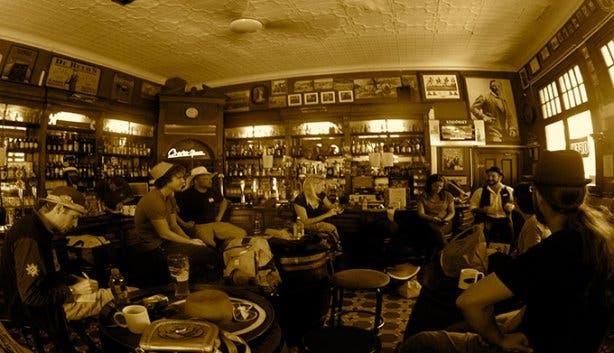 One road leads in and out of Matjiesfontein, and on it sit a coffee shop, a museum (which our passports gained us free entry into), an out-of-service two-pump Shell Petrol Station, the Laird’s Arms pub and the Rietfontein Nature Reserve, our evening lodging. Before our night of old-style shindigary began, we had an hour or so to explore the storybook gardens and unwind on the white-linen clad beds of our classic accommodation of yesteryear. 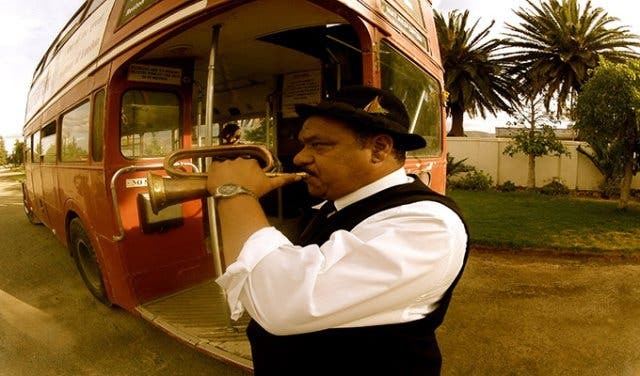 Then, things kicked off with a hilarious, lightening quick bus tour of Matjiesfontein, and got progressively more jovial over a dinner of traditional Karoo lamb. The meal is usually cooked over the braai (barbeque), but that night the cold, rainy weather just wouldn’t allow it. We took an after-hours gander at the artefacts in the museum and heard a couple of eerie spirit stories about forbidden love and haunted bridges (Matjiesfontein has a lot of friendly “visitors”). We also experienced the splendour of the Karoo’s star display and indulged in plenty of merrymaking thanks to honky-tonk music from the old piano at the Laird’s Arms and perhaps a touch too much celebratory ale. The following morning’s breakfast hit the spot for those of us with aching heads and steps to re-trace, and after one last look at the charming Karoo village we set off on the scenic drive home. On the way, we stopped at the famous graveyard of legends to remind us of the ghosts that roam the arid land, before heading to a local farm for our fill of “jewels of the Karoo” (biltong and dried fruit), which was paramount to survival back in the day (and is probably for some in this day too). The family that owned the farm invited us to their cottage in the KOO Valley, and we feasted on a traditional potjie kos paired with wine from the region for lunch. The journey back to the present day continued, and as a final goodbye to the history and magic of one of the country’s best kept secrets, we visited an old Anglo-Boer War fort just outside of Montagu. Then, with content stomachs and hearts, we settled in for the final stretch as the dream-like Karoo coasted by, the fragrant fynbos and thin waterfalls disappearing behind us. All too soon, like being snapped awake, we were being dropped off at our various stops in Cape Town and back into this century. What a trip. 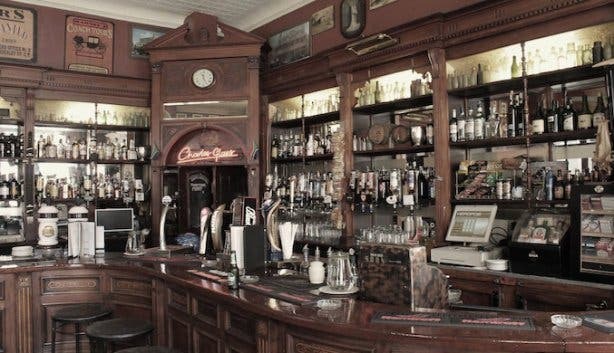 Tip: The Forgotten Route leaves every Friday and is ideal for individuals, couples or groups of friends and colleagues celebrating any occasion. 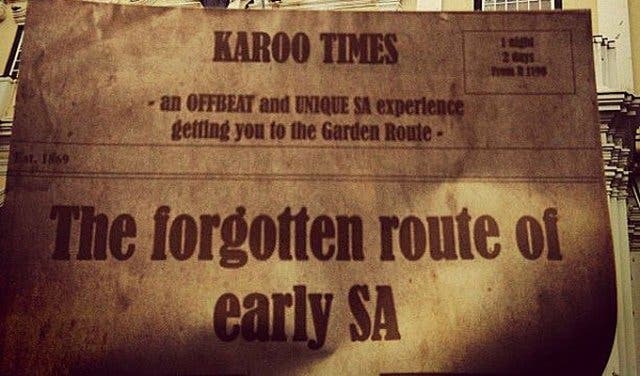 The Bill: At a cost of just R1675p/p (plus an additional R250 single supplement), which includes everything except lunch and drinks, the Forgotten Route tour offers a great value-for-money experience into the legendary South African Karoo. 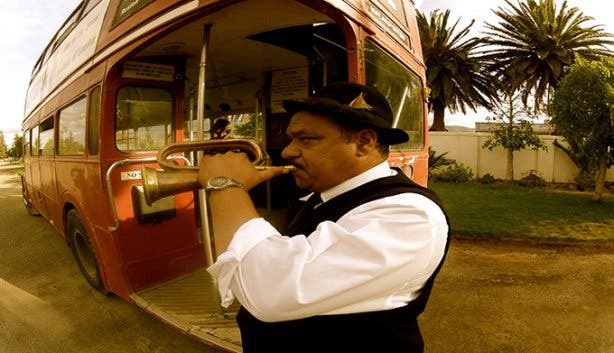 If you're just keen to explore the Cape Winelands, the folks at Wine Flies will show you the right way to do it.